The special Beauty Pearl™ supplement formulation is based on the Philosophy of Regeneration™, with the belief that the body naturally regenerates itself. Healthy skin goes through a natural cycle of renewal, and Beauty Pearl™ helps your skin maintain its beauty by nourishing it. 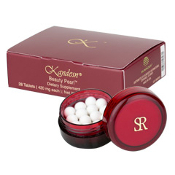 Beauty Pearl™ serves as the perfect complement to the superior line of Kandesn® skin care products that are applied externally. 28 Pills/Container : One Beauty Pearlâ„¢ daily.